"I'm not gonna get involved here. I want that understood right now." 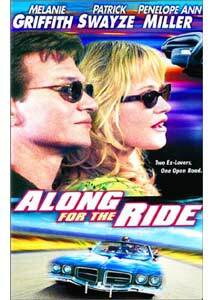 Writer Ben Clifton (Patrick Swayze) goes Along for the Ride when his long-ago schizophrenic girlfriend Lulu (Melanie Griffith) "escapes" from her group home and comes to Los Angeles, where Ben lives with his wife Claire (Penelope Ann Miller). Lulu informs Ben that, unbeknownst to him, they had a child together, which she gave up for adoption while Ben was away at a year-long writer's workshop. Lulu has kept in contact with the adoptive family in Madison, Wisconsin, and she and Ben will be allowed to meet their son for the first time on his sixteenth birthday, now approaching. Ben abandons his lucrative television writing job and drives two thousand miles with Lulu, while Claire flies to Madison to intercept this unwelcome disruption of her marriage. Along for the Ride was released theatrically as Forever Lulu; the title change for the video release is accompanied by new artwork and a tagline ("Two Ex-lovers. One Open Road.") that seems to promise romance and action. But the film remains unchanged—it's an unassuming little comedy/drama that still manages to assume too much. Writer/director John Kaye has written a collection of highly emotional scenes, but has neglected the character development necessary to glue them together into a satisfying whole. Lulu is eccentric and comically "crazy," Ben is earnest and confused, and neither of them changes much during the film. Worse, secondary characters like Claire and the "lost son" Martin (Joseph Gordon-Levitt) are given almost no motivation—their emotions and behaviors turn on a dime at the script's convenience. The plot also relies on contrivances and sudden developments that don't quite ring true. Ben and Claire have a sad secret in their mutual past, but it never registers dramatically onscreen. Major, life-changing decisions are made with little foreshadowing or apparent thought by the characters involved. And it's a bit too coincidental that Ben and Lulu's favorite movie The Hustler (they know the dialogue by heart) is playing at a revival house in Madison when they come to town to see Martin. And there are really no surprises in the story as a whole—despite the erratic course of the screenplay, it's clear where all of this is going by the end of the first act. What we're left with is a series of intense, emotionally charged scenes that never quite gel into a movie. It's like watching an actor's workshop or a director's demo reel—the performers get to unleash every emotion known to the craft, and there are some very intense moments. But the characters don't seem to be the same people from scene to scene, and a certain coldness pervades the whole affair despite frequent heated exchanges. One can't fault the cast too seriously—this is precisely the kind of material that actors love to chew on, and the inevitable overacting is still fun to watch. And John Kaye's visual direction is competent, although it's hard to judge the composition here due to the pan-and-scan DVD transfer. But the whole is considerably less than the sum of its parts, and when the end credits roll, most viewers will feel nothing but relief. Image Transfer Review: In a surprising step backwards, Artisan's DVD presents Along for the Ride in a 1.33:1, pan-and-scan presentation, apparently extracted from a 1.85:1 or 1.78:1 original. It does not appear to be an open-matte transfer, as framing seems awkward and actors in a number of scenes are only partially onscreen when speaking. While the image is generally clear and crisp where details and colors are concerned and exhibits no analog video artifacts, the transfer is rendered in 30-fps interlaced format with 3:2 pulldown and "combing" built into the transfer. The interlacing cadence seems unusual (A, B, C, C/D, D/E, E, F, G, G/H, H/I, I...) and I suspect even progressive-scan DVD players will be unable to avoid the stairstepping and scan-line artifacting inherent to the transfer; it just doesn't look like film. The image quality is otherwise solid aside from heavy edge enhancement in a few shots, but the modified aspect ratio and video-like transfer drag this grade down significantly. Audio Transfer Review: Along for the Ride is presented in Dolby 2.0 Surround format, drawn from the original 2-channel Dolby Digital theatrical soundtrack. It sounds just fine, with clear dialogue, crisp music, substantial bass and some effective use of the matrixed mono surround channel. The sound mix is solid and appropriate to the film, and I have no complaints in this department. Extras Review: Artisan's presumable lack of confidence in this title manifests most visibly here—while the disc features a one-and-a-half minute promotional video trailer, there are no other extras: no subtitles, a bare-bones title menu, and NO chapter selection menu. The feature is broken up into 22 chapters, and they seem to be logically placed, but they're only accessible from the remote—the disc features no chapter selection menu of any kind, and the keepcase insert does not list the chapters either. I haven't seen a DVD release this simplistic in quite a while. Along for the Ride (released theatrically as Forever Lulu) is a strident, frustrating drama, occasionally intense but incredibly erratic. Artisan's DVD features good audio, but is marred by a pan-and-scan video presentation and a near-total absence of extras. Not recommended.